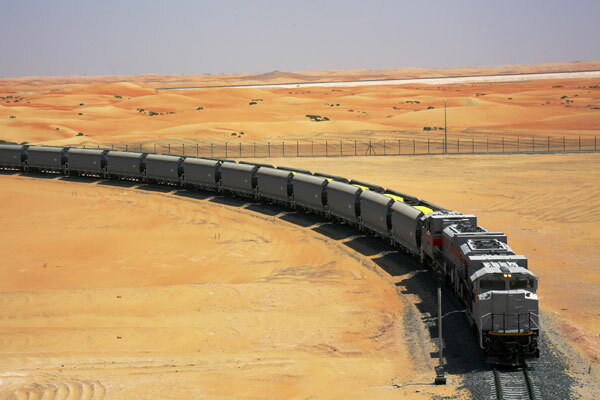 Etihad Rail, the developer and operator of the UAE's multi-billion dollar fully integrated national railway network, has since commencing Stage One operations, transported 10 million tonnes of granulated sulphur for the Abu Dhabi National Oil Company (Adnoc) as of February 10, from sources at Shah and Habshan to its point of export at Ruwais. Since having received approval for commercial operations from the Federal Transport Authority’s (FTA) – Land and Maritime in December 2015, two trains move along the Stage One network daily under the current timetable, each carrying up to 11,000 tonnes of granulated sulphur. To date, the monthly average tonnage of sulphur transported stands at 410,000 tonnes, with the seven million tonne mark having been surpassed at the end of August 2016. “The Etihad Rail project is emblematic of our zest for sustainable development, fostering innovation, and unsurpassed commitment toward revolutionising the UAE’s socio-economic landscape,” remarked Faris Saif Al Mazrouei, the chief executive of Etihad Rail. The 1,200-km-long Etihad Rail network is part of the government’s plans to invest in excellent transport infrastructure, with the aim being to further strengthen the UAE’s position as a leading logistics hub, facilitating connectivity between trading partners in the region and beyond, through integration with key ports of the Gulf and Arabian seas. Stretching a distance of 264-km, Stage One links the sulphur sources of Shah and Habshan to the export point of Ruwais via the Mirfa depot. Built to international standards, Stage One utilises seven state-of-the-art locomotives from US-based Electro-Motive Diesel, with wagons supplied by China’s CSR Corporation. Etihad Rail is being developed in line with the core tenets of Abu Dhabi Economic Vision 2030 and UAE Vision 2021, which collectively call for economic diversification through strategic initiatives set to bolster UAE socio-economic growth. "Stage One’s continued progress underpins our vision to create significant benefits to the UAE through a faster, safer and more reliable alternative transport system," remarked Al Mazrouei. "Transporting high volumes of sulphur per year is only the beginning of our efforts to expand the UAE’s logistics capabilities when transferring goods and raw materials from their source points to their final destinations," he added.